The sun is shining in Minsk for the first time since Sunday's presidential election. That will bring some relief to the die-hard group of opposition supporters who are still camping out in the corner of the city's October Square despite warnings from the authorities. About 120 people, most of them students, have formed a human chain around this small tented encampment, fearing they could be forcefully moved from the site at any time. Scores of arrests have already been made. Some protesters were detained on Tuesday night as they left the rally one-by-one to get some food or visit a toilet. By Belarus' standards this is a daring, unprecedented protest. For four days now, protesters have defied official warnings to make their voices heard. Many here know they are taking a huge personal risk. One of the students, Volya, said she feared losing her university place. "You can see around us men in the black - the police. And they just film us," she said. They can just show our pictures to others and then we can have problems later. We can have problems at university, lose our jobs, we can have problems with anything." Another protester, Pavel, said: "Everyone here feels that it's worth it." "This is our chance, our one chance to change the situation. If we don't influence President (Alexander) Lukashenko and the decisions of the authorities now, nothing will happen," he said, looking pale and tired after spending more than two days on the square. But this is a no Ukrainian-style revolution. 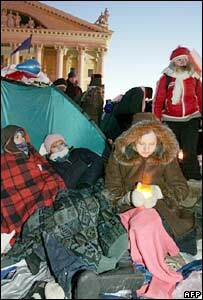 In Kiev, in the Orange Revolution of 2004, there were hundreds of thousands of protesters. In Belarus, the opposition recognises they needed 10 times as many people as they had on Sunday, the first night of protests. The political situation is very different too. The opposition in Belarus has no foothold in any centres of political power. There are no "dissident oligarchs" prepared to back their cause, and there are no independent broadcast media to spread news of their activities. President Lukashenko is also genuinely popular among many Belarussians. On Wednesday, skaters were enjoying an afternoon on the ice at the other end of October Square, while shoppers and workers walked by. Life here is going on as usual. At one point, a large number of elderly people turned up to tell the young demonstrators exactly what they thought of the goings-on. They shouted "disgrace" and accused the protesters of being paid. It is not difficult to imagine what one of the news stories might be on state television tonight. But there are now signs of a division over whether the protests should continue. Main opposition candidate Alexander Milinkevich has urged his supporters to remain in October Square until Saturday, when they hope to stage a large protest to celebrate the anniversary of Belarus' short-lived republic in 1918. The other influential opposition candidate has called for the crowd to disperse for fear of a crackdown by the authorities. The question is whether the authorities will allow such a symbolic event to take place. And how many people will be emboldened by what they have seen in these last few days to join in? Whatever happens, the opposition parties hope a seed has been sown which will eventually usher in a new future for Belarus.